Healthy food and a well-balanced diet is very important for our children, not only to support their growth and increase their concentration at school, but also to learn and develop good eating habits as a foundation for a healthier and longer life. Unfortunately nowadays its much easier to feed kids with junk food. Junk food is everywhere, and if you ask children about their favorite foods, many will list French Fries, Pizza, and Pasta. More than often, such foods are made with ‘bad’ carbohydrates, for example, those containing refined sugars or grains, have a high calorie density, and are high in sodium, saturated fat, or cholesterol. Many parents think that healthy food is difficult to make and takes longer to prepare, but that’s incorrect. It just requires a bit of planning ahead when going grocery shopping, and ‘bad’ carbs can be replaced by ‘good’ carbs. We’ve generally been eating healthy, but about a year ago we made a change to reduce carbs even more. Step by step I replaced ‘bad’ carbs with the right amount of good carbs. For example, now the kids’ pasta is made from spelt or other whole-grain ingredients, and they love it. Same with some of our crackers and bread, for example, Nutty Crackers and Carb-Free Multi-Seed Bread. With fruits we never had a problem, they love any kind of berry’s, either fresh, with their yoghurt, or as smoothies like the Forest Berry Smoothie. In terms of vegetables, they like some and not others. Sometimes I puree veggies and add them to their food, for example, pureed zucchinis into a tomato sauce for pasta. 😉 Of course, at times you have to experiment a little to see what they like. For example, the Banana and Applesauce Pancakes took a small number of iterations before the kids liked them (initially I made them with coconut flour, which I found they don’t like at all). Other examples of dishes that are easy to make and the kids like are in the Kid’s Recipes section. My daughters love to help me in the kitchen and we often cook together. My oldest daughter also started to be very interested in nutrition and we often have conversations about it. 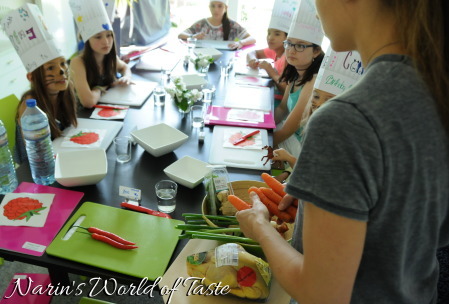 Thinking about how important it is to teach our children healthy eating habits, I thought it might be a nice idea to teach kids that cooking healthy food is delicious and can be lots of fun. 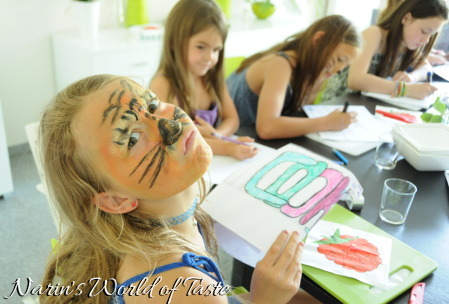 The first step was to come up with a few recipes that kids would enjoy eating and not too difficult to cook. I asked Zoe to put together some of her favorite meals and we picked three that we thought everybody might like: as starter, Thai chicken and prawns soup with homemade broth from an organic chicken and vegetables; for the main, Mexican food (spicy beef, guacamole, tacos & tortillas); and for dessert, a carb- and sugar-free apple pie with homemade ice cream. 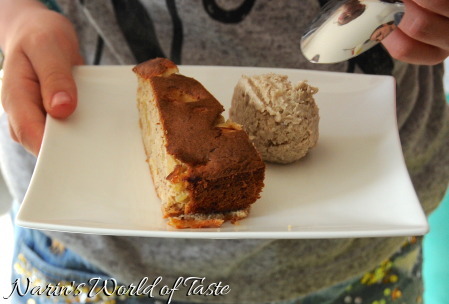 I wrote down the recipes in German and with child-friendly instructions. We also created a folder for each child to take home that includes the recipes and nutrition informations about a healthy eating plan. The big day arrived, the preparations were done, and the cooking party started. The kids were all very excited. As a little surprise, I ordered cookhats for them that they could design themselves before we started cooking. 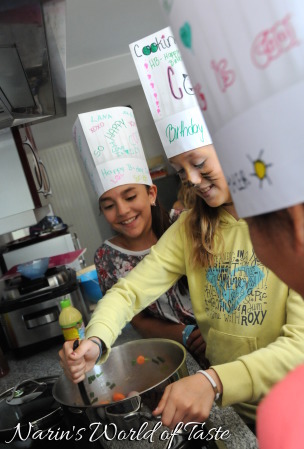 The kids then followed the various steps of the recipes. The most fun they had with the apple pie. They completed every step by themselves, starting with copping the apples, measuring the ingredients, separating the eggs, and mixing the dough. We formed groups of two kids, and each group was responsible for one of the steps. This worked really well. Overall, the party was a success and the kids really enjoyed themselves. At the end, we served the food buffet-style and everybody including the parents could taste the food. The kids especially loved the soup and the homemade ice cream and apple pie, and everyone enjoyed the Mexican food. It was great learning and a lot of fun for everybody. In hindsight, I think the recipes were still a bit complex for the children. There were quite a few steps to prepare the starter and main dish. I will be thinking of ways to simplify some of the steps, or use recipes that are easier to prepare and cook. 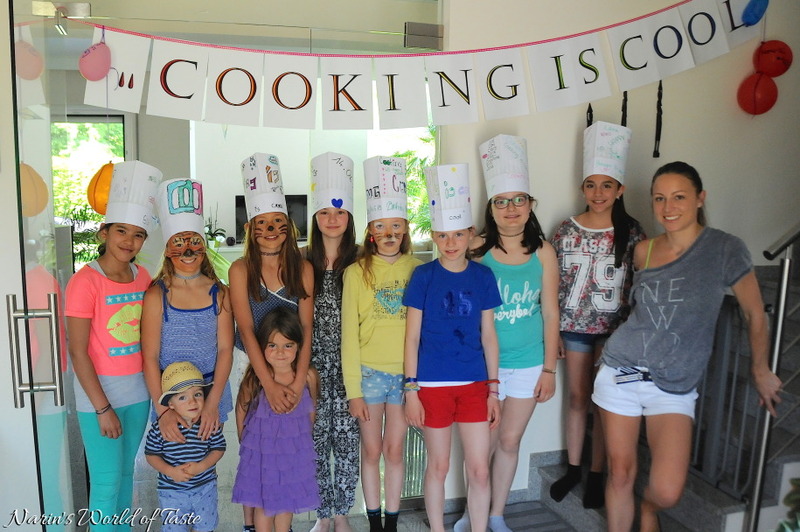 “Cooking is Cool” and working with kids is a project that I’ll be refining. Great blog. There’s a lots good data in this blog, though I would like tell you something.I never usually post on blogs but I have found this is very useful work.